Historic building, exposed beams. First floor, double entrance to the main street and to the side street (private entrance). 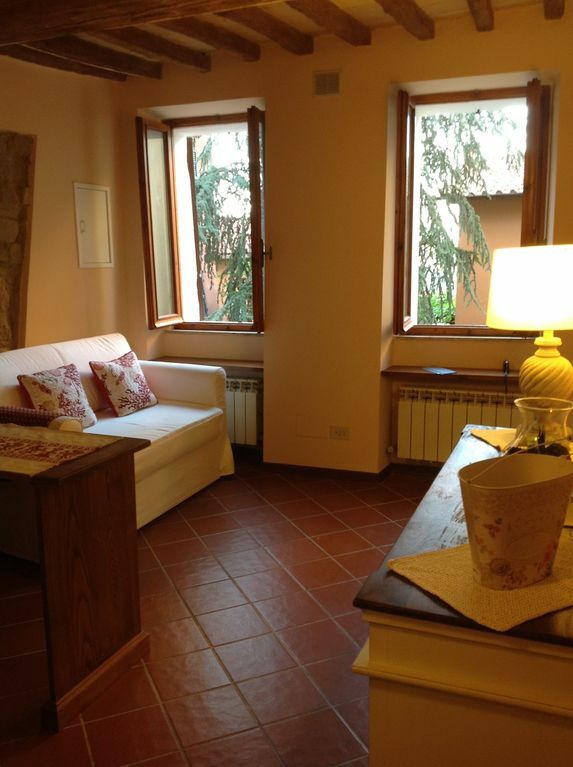 Central location 100 meters from the University for Foreigners, overlooking the garden. Quiet. Double bedroom, living room with kitchenette, bathroom with shower. Storeroom on the landing. Fully equipped, linen included. Double sofa bed in the living room. Baby equipment on request (high chair, cot). We love Perugia and this place is centrally located close to town, incredible sights, chocolate, dining, art, bus stations, and shops. This kitchen was adorable and fully equip with everything you needed, we cooked often. Just take a week and enjoy Perugia, this is where you go to recharge, reconnect and celebrate life. The people are incredible. Consider the chocolate festival (Oct), Umbrian Jazz (July), the gelato, the Deruta pottery. This is truly one of our favorite places in the world. Barbara's apartment was comfortable and a very convenient location. We did not use the little kitchen, but it was handy and available. The apartment was quiet as well. A few doors down is a good restaurant run by American ex-pats -- would definitely recommend. Barbara was responsive to our inquiries. You were perfect guests and it was a pleasure to have you for a while with us. Thank you! Perfect for a couple wanting to experience Perugia! My husband and I spent a month here while we took an Italian language course at the university. It became our home and we loved it. It is lovely, little, but well appointed. The is no oven, but there is a microwave and good pots to cook lots of pasta! There are windows and nice light and fresh air which is important to us. We were a stones throw away from the university and a short walk (up! Perugia is built on a hill remember!) to the square and all the action. It is a college town so there is noise at night. We got used to it. Barbara is a lovely person and easy to work with. Close to everything and the apartment was cleaned while we were there and sheets changed!! My husband and I spent a very nice five days in Perugia. Thanks to the owner Barbara, everything was perfect. The apartment is small but cosy and very clean. The location is good, only a short walk uphill to the Piazza Danti. We parked the car at Viale S. Antonio which is free. But it could get crowded. When we went out by car, we couldn't find a place when return, so we parked at S. Antonio garage, 17 eur per day. The only flaw would be occasionally loud music during the night, from the nearby bar. We really enjoy our stay and would recommend this apartment. Thank you very much for you words. Please come back again at any time! We are a family of four and had no problems with the sleeping arrangements for a weeklong stay. Probably the smallest location we've used during two months in Italy, but extremely well decorated and comfortable. A perfect location for the euro chocolate festival. The kitchen is very well stocked. It's not large enough for cooking huge meals regularly, but would probably be perfect for cooking meals for 1-2. However, being a college town, there are endless inexpensive eating options nearby that kept us from wanting to cook anyway! The owner is extremely kind. When we had vehicle problems, she was very accomodating with checking us in. The apartment is in a central location, 100 mt. University for Foreigners and overlooking a garden. The main cultural and tourist attractions of the city can be reached on foot. Other historic cities (Assisi, Gubbio, Todi) are easily accessible by bus, from the bus at a distance of about 15 minutes walk. Perugia is home to major events such as 'Umbria Jazz', in July and 'Eurochoccolate' in October every year. La tariffa standard è per due persone. La terza persona ha un costo supplementare di €10 al giorno, la quarta persona è gratuita. Bambini fino a 4 anni gratuiti dai 5 ai 12 anni €5 al giorno. Nessuna tassa per cambiamento date prenotazione, secondo disponibilità. Il 30% di anticipo non viene restituito in caso di cancellazione a 10 giorni dall'arrivo.